Strongpoint is excited to announce a series powerful new features and enhancements in our latest product release of Strongpoint for Salesforce, Version 2.3. Version 2.3 is now available for your sandbox for pre-release. Note that we will be pushing the 2.3 upgrade to your production account during off-peak hours starting February 9, 2018. When deploying multiple changes from one environment in Salesforce, users can run into limitations, thus making this critical process very risky. Strongpoint’s Release Management functionality is fully integrated into the change management process and provides detailed analysis of any issues. With this capability, users now have the ability to rollback the changes they have made to production and restore their system back to its previous state. Users also have the flexibility of rolling back selected components of the deployment, allowing them to take corrective action on specific problem areas within their deployment. Similar to how release deployments function in Strongpoint, this feature requires that a release rollback follows a comprehensive approval process, which is critical for organizations who require a full audit of their entire release process. Sometimes a new production release will contain a critical bug that impacts its business users. In certain cases, a production hotfix is not feasible due to the high turnaround time to develop a solution or the business risk associated with another deployment. In this case, Strongpoint enables Administrators and Release Managers to quickly restore the system back to its previous state while developers resolve the underlying issue. Companies are often required to test changes outside of production to reduce the risk of breaking their critical production environment. Any evidence of this process is erased when sandbox accounts are refreshed. With this new capability users can now migrate Change Requests between different environments and provide auditors with documentation that the changes to production were properly reviewed in another account (i.e. UAT) before being deployed to production. A new production release is being planned and the System Administrator uses Strongpoint to create a Change Request outlining the changes being made, and proceeds to have the Change Request approved. This Change Request is defined in the production system since the development Sandbox environments get refreshed on a regular basis. This Change Request is then pushed to the development sandbox, where the development team will action the change. 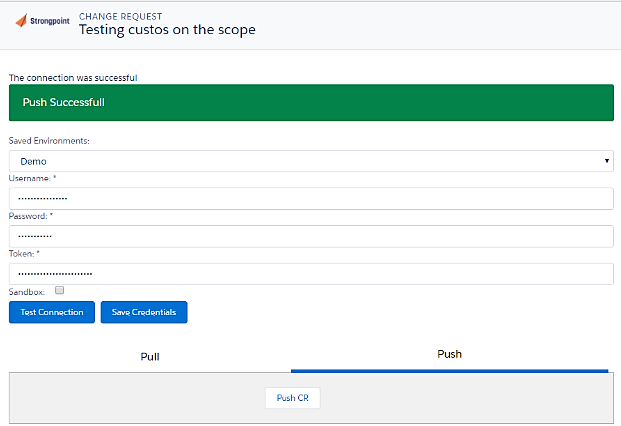 Once development is complete, the Change Request is marked as complete and pushed back to the product environment where a deployment ticket is created. Strongpoint extends a special thanks to all of our customers who shared their product feedback with us and requested this feature. Strongpoint is now making its Environment Compare feature available to all existing customers with Intelligent Change Management - free of charge! We’ve improved the look-and-feel of the impact analysis screen. You can now open impact analysis in a new window, giving you more room to view the information. You can also export the results directly to Excel. Footnote: Previous release notes and more technical information about Strongpoint can be found in our robust user guides, which can be found directly from your account under Strongpoint > Strongpoint Support > User Guide.